A classic is a classic for a reason and this country style 5 piece dining set from RC Willey is a great addition to any home. The solid oak table has a laminate top that makes it one that will endure homework and crazy game nights. The table expands to 96" with both leaves in place so you can fit everyone when you need to and only a few when you don't. Includes 60" table and four side chairs. You'll love the country feel of this classic trestle base dining table from RC Willey. The large posts provide a solid base for this table that expands to 96" with the two leaves in place. It's perfect for daily use and for large family dinners. 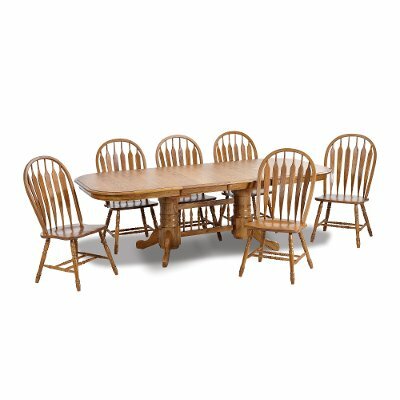 Includes (2) 18" leaves that expand the table to 78" and 96"
Oak Country 5 Piece Dining Set - Classic Chestnut is rated 4.1 out of 5 by 8. Rated 3 out of 5 by choppers Watch what you get The Table is a really nice table and we bought this because of the hideing exstender to make the table bigger. What is the junk is the chairs. 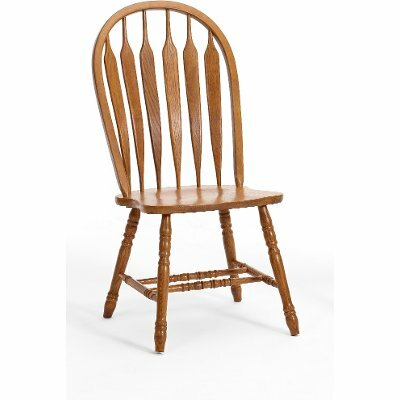 The wood peices that sturdy up the legs are not the same on one chair. It makes that chair look ugly but after returning all the chairs once and getting six chairs the odd ball sits in storage in case we need it.Make sure you check all parts when they are delivered. Rated 5 out of 5 by Toasted74 18 Years and Still Amazing! We bought this dining room set over 18 years ago and absolutely love it! After all of these years, moving overseas twice, and a grand total of 4 moves, the table is still solid. The chairs have held up well, but we recently bought new chairs. Not bad after 18 years, and only paying $600 at the time. Thank you RC for selling such an amazing set! Rated 1 out of 5 by Warriors Beware of the finish We purchased this item and within a year the finish began to flake of the table. We returned the product and received a new set. A couple years later it began again and got worse and worse. I was told they finish these tables in more humid environments and they dry and flake here in the dryer climate. Whatever the case, I'd never buy this set again! I can't believe they still offer it at RC Willey. My in-laws experienced the same problem with their set. Rated 5 out of 5 by Picky2shop "Classic Chestnut" 5-piece Dining Set Beautiful and fits our family's needs. We were surprised how easy it is to add the leaves and extend the table. Top quality for an affordable price. We love it! Rated 5 out of 5 by Imbwj Intercon 5-Piece Dining Set We are pleased with the purchase of our new dining table and chairs. 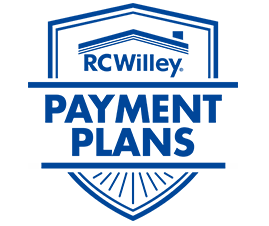 The quality of this product is good, it's a nice looking set and we like the glides that enable one person to extend the length of the table by adding the table leafs that are storable within the table. Rated 5 out of 5 by DreamTable Awesome Table! This table is heavy duty, sturdy, and beautiful looking. We have 5 small children and we needed something that would last for many years and still look nice years later. This is just the table to do this. We love it. And the chairs are really nice and sturdy. Rated 4 out of 5 by CatLady Sturdy Table We purchased this table because it had a formica top and is easy to keep clean. Also has sturdy trestle type legs.